Leven Canal in East Yorkshire is perhaps one of the most unwatched and under-recorded water-bodies in the local area for Odonata. 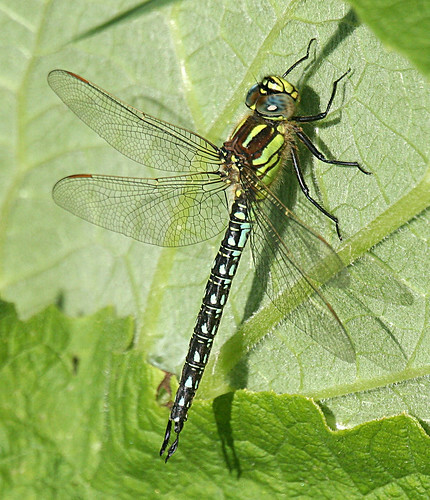 Strange then that it offers by far the easiest opportunity for enthusiasts to catch up with Hairy Dragonfly Brachytron pratense. The count of the canal turned up an impressive 146 – the second highest single site total in Yorkshire history, though this fell a long way short of the 193 I recorded 12 months ago at the same site. Despite the impressive number, photograph opportunities were scarce. The problem being that are so many of them that invasion into territory means they have to constantly see off invaders. However, it does make for an impressive spectacle. Having visited many sites which hold the species, I’ve never seen anything like the number this locality holds. 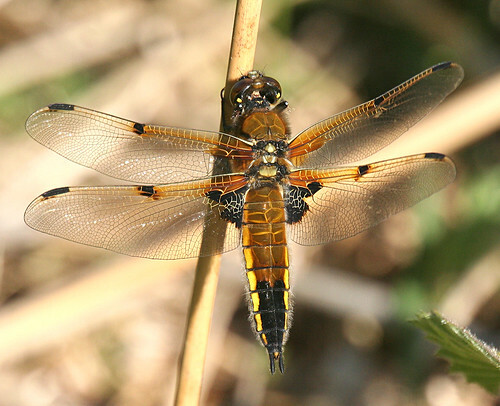 The numerous Hairy population is well supplemented with Four-spotted Chaser Libellula quadrimaculata. Today’s count numbered 217 including two of the scarcer form praenubila and also 2 Broad-bodied Chaser L. depressa – a two metre stretch of vegetation had both forms of Four-spotted Chaser, Broad-bodied Chaser and Hairy hung up in a line!!! 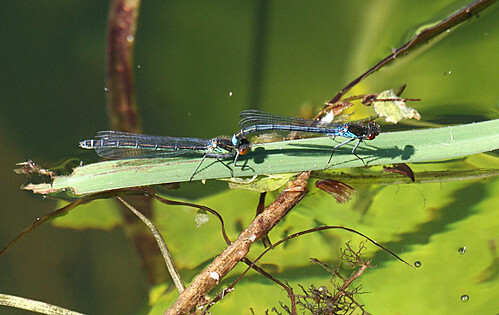 Five species of damselfly were noted – 4 Large Red Damselfly Pyrrhosoma nymphula, 19 Azure Damselfly Coenagrion puella, 1 Common Blue Damselfly Enallagma cyathigerum, 9 Blue-tailed Damselfly Ischnura elegans and 159 Red-eyed Damselfly Erythromma najas. 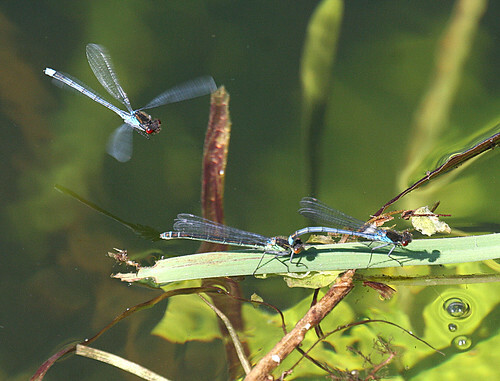 The Red-eyed Damselflies were noticeably down in number for the time of year. However, no doubt many more than were recorded have been forced to take refuge in the vegetation on either side of the canal due to the lack of lily-pads available in certain areas. However, even though few were encountered, those that were in cop still suffered harassment from others in the area. 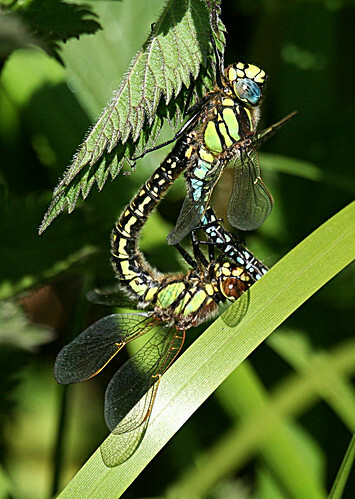 If you want to see Odonata at its best – why not take a walk? Then submit your records to the Yorkshire Branch of the British Dragonfly Society.